The SM58 is the world’s most popular microphone; built to last and designed for vocals the Shure SM58SE featuring an on/off switch will se.. The SM58 is the world’s most popular microphone; built to last and designed for vocals the Shure SM58SE featuring an on/off switch will serve you for years to come. The SM58SE, like all Shure products has been built to last. The casing on the microphone has been created entirely from metal for a heavy duty ruggedness that can withstand the rigours of touring and even the most lively performances. The simple steel mesh grille design works to protect the highly receptive microphone cartridge within. Designed to be tough yet act as “crumple zone” should the microphone be dropped or thrown, ultimately protecting the microphone itself inside. The Shure SM58 with switch has been designed for use with vocals and as such it is tuned to accentuate the warmth and clarity of lead and backing vocals. but it can also be used to great effect for public speaking, conferences, and places of worship when a durable microphone that doesn’t compromise on quality is required. The unidirectional cardioid polar pattern ensures that only the desired audio source (such as your vocals) is captured and cuts down on unwanted background noise. A pneumatic shock mount virtually eliminates handling noise and vibrations on stage. The SM58SE features a switch on the side so you can stop capturing audio with the flick of a finger. This gives you full control of when you are transmitting audio. This works great for live performance situations and works especially well in public speaking applications, particularly when multiple people are set to speak. 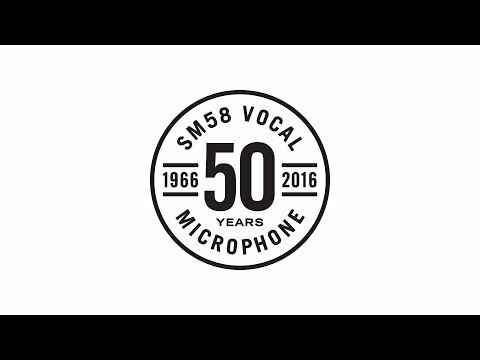 There are numerous design features that have lead to the SM58 being the world’s most popular microphone and such a legendary piece of equipment. The iconic steel mesh grille designed to dent on impact works as a shock absorber to protect the valuable cartridge inside from damage. Foam on top of the resonator cap works as a second stage of pop filtering while the pneumatic shock mount aids in eliminating handling noise and vibrations to ensure you’re only capturing the audio you want to. The tailored porting in the capsule ensures a uniform cardioid pickup pattern across the frequency range so you can get maximum gain before experiencing any feedback. The frequency range the SM58 focuses on is perfect for the capturing of warm, full-bodied vocals while the smooth, low-cut roll off helps to reduce handling noise, wind noise and plosives. The SM58 with switch also features an adhesive compound that secures the transformer while preventing moisture and temperature fluctuations from entering the handle. This also creates an airtight chamber which further enhances the shock mounting and low-end response.